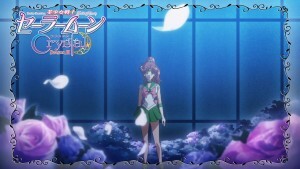 The latest episode of Sailor Moon Crystal aired on Japanese TV Monday May 23rd at 11pm Japan Standard Time. Following this it was available to stream first on Crunchyroll and then on Neon Alley and Hulu, starting at around 10:30am. Act 33, Infinity 7 – Transformation – Super Sailor Moon, introduces us to Sailor Saturn as well as to Sailor Moon’s new powered up form. Everything before the opening credits is repeated footage. We had some of this in earlier episodes too. This is a way to recap but also a cost savings tactic. Not only is this all footage we’ve seen but this repeated footage itself has flashbacks in it, so there’s stuff in here that we’re seeing for a third time at least! The episode starts out with Sailor Moon powering up to Super Sailor Moon. This is probably a deal to some people. I don’t really care about power ups. This is Sailor Moon, not Dragonball Z! The power level of our heroes and their attacks or those of their enemies are largely irrelevant. So Super Sailor Moon beats a level 999 Witch. The struggle between hero and villain is never about power in Sailor Moon. One thing stands out to me here. Who names Super Sailor Moon? 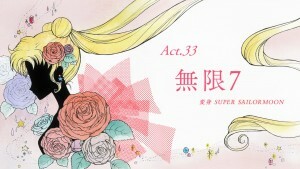 Sailor Chibi Moon recalls the name from her past, Usagi’s future. She is the first to say the name and the rest of the gang catch on and use it. Sailor Moon’s new uniform doesn’t come with a name tag. If Usagi learned the name from Chibiusa and in turn tells her the name in the future, then where did it even come from? Basic paradox. The name Super Sailor Moon is Kyle Reese. Speaking of Neo Queen Serenity, what’s up with that hair? Usagi, Princess Serenity and Sailor Moon are blonde however the Neo Queen Serenity we’ve seen in 30th century Crystal Tokyo has always had white or silver hair up to now. The Neo Queen Serenity we see here is from beyond what we saw in the Black Moon story arc, because Chibiusa speaks to her about Sailor Moon having saved the future and has her uniform she got at school in the past. 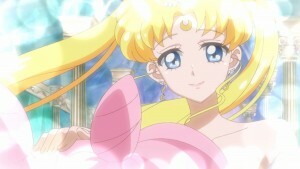 This newer Neo Queen Serenity has blonde hair. Is this a mistake, a new look for Queen Serenity going forward or does she also, like she did in the past, go through transformations between her civilian look and her more formal look as queen? The manga, being black and white, is no help here! Sailor Uranus is upset at the damage to the windows in her apartment. I’d be surprised that the building wasn’t evacuated due to concerns of structural integrity! She admits that her rent is a million yen a month, which is about $9000 US. I’ve paid rent for a year that cost about that! When asked how they afford it Sailor Uranus says that they have patrons so they don’t have to worry about money. Sailor Moon asks what a patron is and we don’t get an answer. So what does this mean? It’s not a word that is commonly used in this sense in English. I originally read the manga in French where they used to French word “patron” which, in Canada, means boss. I thought maybe this was some kind of joke about prostitution. A little research tells me this is hardly the meaning they were going for. As far as I can figure it’s a reference to some sort of financial backer for artistic ventures, which in this case might be Michiru’s violin playing or perhaps Haruka’s race car driving. This does not explain the embarrassment in the statement. Surely there’s something more to this story, but I don’t understand it. 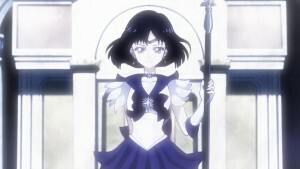 Finally we get to see Sailor Saturn in this episode! Doesn’t she look great? 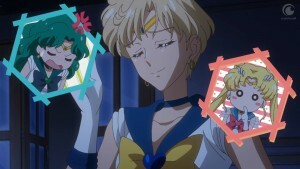 We learn of the last time she appeared, and get to see Sailor Uranus, Neptune and Pluto in their native environments. 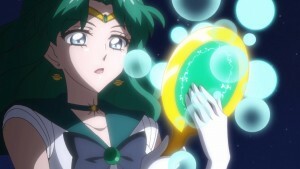 Sailor Neptune appears to be on a rocky planet, which doesn’t really mesh with what I know about the surface of Neptune. The three are then transported to Saturn, which also seems a lot more solid than I would expect, and there they summon Sailor Saturn who shows up and kills them. As Silver Millennium was falling, Sailor Saturn seems to have picked up all the bits and pieces by conveniently killing the rest of the Sailor Guardians. Why? I guess it would be boring for them to keep living for a really long time? 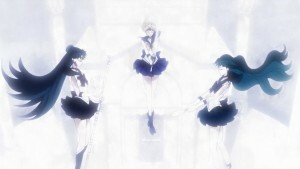 We then learn that the three of them were reincarnated on Earth, although we know of course that Sailor Pluto was reincarnated from her future self, unless there are two that is. 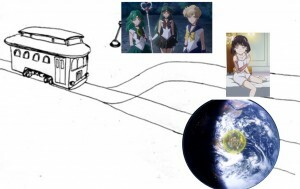 Once again we have a trolley problem as we weigh the morality of killing Hotaru to save the world. It’s simple really. 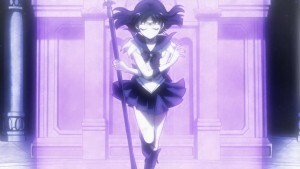 If Hotaru becomes Sailor Saturn, she will destroy the world. 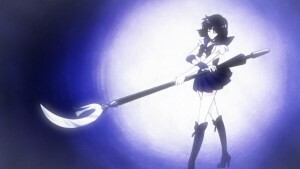 This will kill everyone including Sailor Saturn. Alternatively if Hotaru is killed, everyone else survives! Also Hotaru is dying anyway. 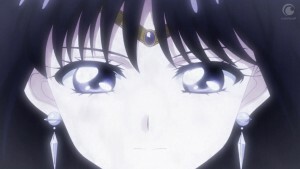 The only way to cure her is to let her become Sailor Saturn which means everyone dies. This is sort of like the trolley problem. In this thought experiment a trolley is flying out of control down a track which will kill five people. You can pull a lever which sends the trolley onto another track which saves those five and kills one person. Do you pull the lever? I feel like my experience with Sailor Moon has taught me that I should not pull the lever. Utilitarian ethics dictates one should go for the greater good, and should feel morally obligated to pull the lever. 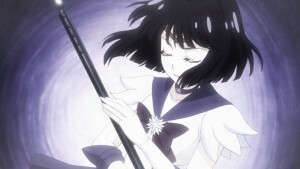 Similarly, the morally correct solution to the Sailor Saturn problem, prioritising the needs of the many over the needs of the few, means that Hotaru should be killed. Sailor Moon doesn’t go for this and neither does Chibiusa. They are convinced there is a better way in which everyone can be saved. 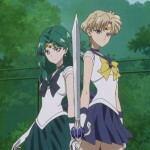 They refuse to sacrifice one life at any cost, but Sailor Uranus, Neptune and Pluto are more practical about the issue, opting for child murder to save the world. Would you pull the lever? 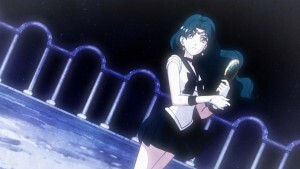 Sailor Pluto makes the argument that because the future exists Sailor Saturn must have been killed. This is a really odd comment, and reminds me of seeing a later episode of a TV show and then going back, knowing they are going to get to a certain point and trying to figure out how. It makes me wonder of course whether or not Sailor Pluto lived through these years already, in the past of the future self which died and was reincarnated in the present. If she did then she would remember the world not ending and possibly some serious stuff going on in Tokyo around this time. I don’t think I’ve addressed the issue of flying before. In the old anime, there was usually no flying, but in the manga the characters seem to fly around a lot. They do it a lot in Crystal too, and because it’s animated it’s more obvious than seeing static people floating in manga pages. This week we see the Sailor Guardians fly right into the broken window of the apartment building but more specifically this includes everyone but Sailor Chibi Moon and Tuxedo Mask. Are they unable to fly? They show up a bit afterwards and then when Sailor Chibi Moon runs off she literally runs away, through the elevator and then jumping from rooftop to rooftop, at a height of over 20 feet with every jump. When she gets to Hotaru’s place, Sailor Uranus, Neptune and Pluto beat her there, but were nice enough to not murder her friend. It certainly would make sense that Sailor Chibi Moon be less powerful than the rest. I imagine Tuxedo Mask can fly but was being a nice guy accompanying his daughter who can not. 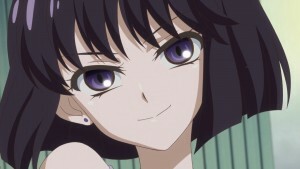 Hotaru may not turn into Sailor Saturn this week but she does transform into Mistress 9. 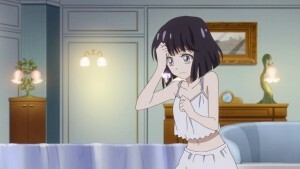 She basically kills Sailor Chibi Moon by stealing her Silver Crystal and then turns into this older eviler version of Hotaru. In the manga she doesn’t appear with the dress and everything in this chapter, but here she does. 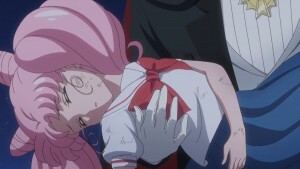 Chibiusa is essentially killed in the process. This is Sailor Moon though so she’s only mostly dead. Next week is Act 34, Infinity 8 – Infinite Labyrinth 1. Chibiusa’s dying, Mistress 9 is running amuck and we’re still debating whether or not it’s cool to kill Hotaru who isn’t all that innocent any more. I believe we will be seeing the third opening and ending songs with Act 34, though I’m not sure. 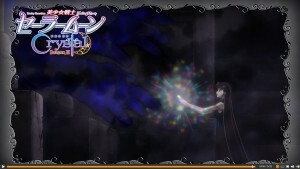 The second themes appeared for the 5th episode following the first CD release. The second CD came out today, May 25th, and the next episode is the 9th of this story arc with 5 remaining. The new intro will still be In Love With the New Moon but this time performed by Momoiro Clover Z. The new ending theme will be Only Eternity Brings the Two Together, sung by Kenji Nojima, the voice of Tuxedo Mask. Keep reading for more screenshots from Act 33 and the preview for Act 34. 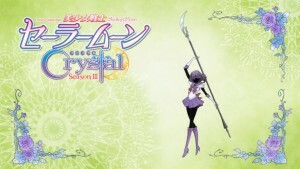 This entry was posted in Pretty Guardian Sailor Moon Crystal (2014) and tagged Chibiusa, Holy Grail, Mistress 9, Neo Queen Serenity, Sailor Moon Crystal Act 33 - Infinity 7 – Transformation – Super Sailor Moon, Sailor Moon Crystal Phase 3 - Infinity, Sailor Neptune, Sailor Saturn, Sailor Uranus, Super Sailor Moon, The Trolley Problem by Adam. Bookmark the permalink. waiting for English dub i don’t mind waiting also how many episodes are in this arc??? The name “Super Sailor Moon” seems more like a stable time loop than a paradox to me. It’s logically consistent, isn’t it? Sure, there’s no “ultimate source” of the name, but I don’t think there needs to be one. Is the future Chibi Usa came from still the same timeline they are currently on? I mean, in a way, couldn’t Usagi now prevent the Black Moon Arc from ever happening, saving Pluto from dying and splitting things into two timelines at least? This would make sense why the inners didn’t have their Eternal costumes. To put it bluntly, Naoko Takeuchi was terrible at writing time-travel stories. The only way to LOGICALLY explain what happened is a split timeline, but that isn’t consistent with how Chibiusa reacts to things that would prevent her birth. The continuity of Sailor Moon is an insane mess. 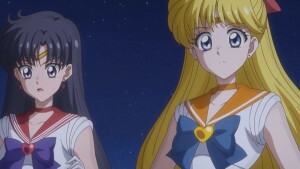 I enjoyed this episode, but my nerdiness was intensely bothered by some of the Super Sailor Moon stuff. 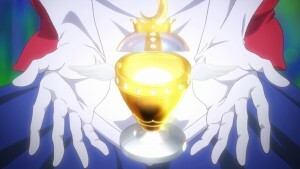 “Moon Crisis Make Up” is her transformation call using the Crisis Compact, not the Moon Chalice, where she simply should say “Crisis Make Up!”. Also, her final pose at the end of Rainbow Moon Heartache was the wrong on. I am disappointed! Thats honestly shocking as voice acting along with music has always been 100% spot on. They may change it in the English Dub. If you remember back in the Princess D episode Sailor Moon uses Moon Twilight Flash. In the Japanese version she doesn’t say an attack name, but in the English Dub she actually says Moon Twilight Flash. I was grateful that the English Dub “fixed” that! It made it seem more authentic. That particular paradox, where something seems to cause itself through time-travel, and there’s no beginning and no end, is known as a bootstrap paradox. 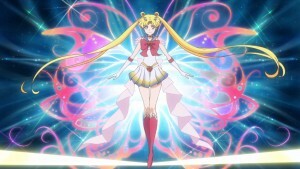 By the way, wasn’t that transformation into Super Sailor Moon simply beautiful? But, whether it’s a paradox at all really depends on your axioms. If you assume everything needs to have an ultimate cause, then obviously the “bootstrap paradox” contradicts that axiom… but the Big Bang theory seems to contradict that axiom too. Maybe it’s the axiom that’s wrong. Maybe things don’t need an ultimate cause. Mind you, there’s still a paradox in the “bootstrap paradox” if it’s material rather than information that’s traveling through time (it would violate the third law of thermodynamics, I think?). But that’s not the situation here. And didn’t Uranus and Neptune arrive from their floating moon castles and that’s why the ground where they are looks as it does? Not sure but it deff seemed like a cool area! I want a Neptune side story damn it. I can’t believe Hotaru became Mistress Nine. What will happen to Sailor Mini Moon? This is paradox mambo jumbo is making my head spin although I learned a little bit. I am just disappointed that Super Sailor Moon’s transformation was overshadowed by Sailor Saturn’s back story but then again this pacing problem is really like a running gag in Naoko’s writing style so I cannot complain more. 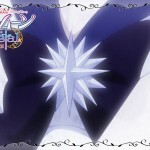 Is it just me or I find Super Sailor Moon’s skirt in the final pose not symmetrical? Your center point is why I think that “Un Noveau Voyage” is the best Infinity Story we’ve gotten (outside of the 90s anime personally) the sequence of events were changed and thanks to it the pacing is DRASTICALLY improved and the story resonates a LOT better. For those that haven’t seen it, Pluto’s return is saved until a bit later and it is she who interrupts the battle between the Sailors, they then explain their mission and the Mistress 9 stuff happens. 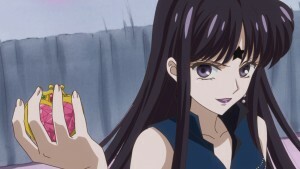 While attempting to kill Mistress 9 the Outers are captured and in the end, after witnessing Mistress 9 torture the Outers, Sailor Moon rescues them by declaring her faith in Hotaru and handing over her crystal, in which her kindness and love allows Hotaru to overwhelm and stop Mistress 9. Touched by Sailor Moon willing to sacrifice herself for them and her love for even her potential enemy, the Outers unite with the Inners and Super Sailor Moon is born. While it means that Super Sailor Moon is only around for the fight against Pharoah 90, the pacing is faaaaaaaaaaar better. 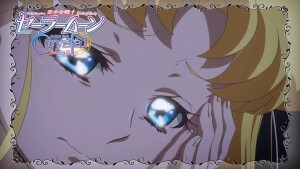 I think the blonde hair of Neo Queen Serenity is just a mistake and will be corrected for the Blu-ray release. Speaking of odd coloration: shouldn’t Saturn’s tiara gem be white instead of purple? I agree- it’s super annoying that in this episode and the last, they’re starting to make these sloppy lazy mistakes again. What the heck toei? Glad to see I wasn’t the only one to be annoyed by Neo Queen Serenity’s new hair colour ! Also, you’re right, Saturn’s tiara gem should be white. I too was annoyed by this “detail”. Hope both those mistakes will be fixed in the next episodes ! I’m not too fussed with the hair, as Season Three is clearly a new animation direction to the first two seasons, so I’m not going to be upset of hair colour changes. As for Saturn, I believe she was inconsistently coloured with either purple or white, but her “Eternal” form consistently is drawn with a purple star, so I suppose they decided to have her stick with purple for the entire series. 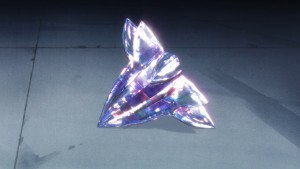 I too prefer the white gem the original anime stuck with, but I can deal. I read somewhere that the spelling of “patrons” used in the Japanese manga can mean “sugar daddy”. This explains the candy in the background of the panel. Haruka is just kidding, but that’s why Michiru is so embarrassed. That would make so much sense! Well, the word in Japanese is “danna”. A wife can refer to her husband as danna as it means husband but it’s more rare these days. More commonly it was used for a older wealthy man that often would sponsor a geisha (woman trained in traditional arts not a prostitute) and in most cases she would become his mistress in return. So the word might have a certain “ring” to it that can raise a few eyebrows. This episode was better than the previous episode. In terms of execution it was still lacking. Animation quality was not all that great. Character models were off sometimes. They repeated the same scene at least twice with Saturn and those flashbacks were unnecessarily repeated. I can’t believe I waited that long for them to basically repeat the attack animation of moon spiral heart attack for the Rainbow moon heart ache. At least the 90’s version changed up her final pose. 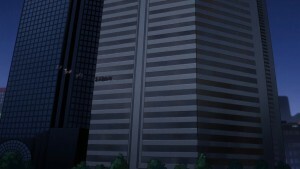 Seeing how season 3 is only 13 episodes, I was hoping they would create a new attack animation. Especially since we know they will reuse the attack for several episodes anyway. I am tired of seeing the moon spiral heart attack animation. Toei is so cheap and lazy. With no Pluto transformation or introduction sequence in sight, this was another disappointment. They could have even made a shorter new attack sequence for Rainbow moon heart ache. Some dialogue with the inner soldiers saying that the Outers have no right to end Saturn’s life was sadly left out. I think those would have been some nice moments. The fight with Cyprine in the manga was terrible and here it is just as bad. Realistically Cyprine would have attacked her before she gather’s the other Soldier’s powers, but the whole time she is too busy floating with her sister. Doing nothing. This was one of the things they could have tried to do better in Crystal. In the manga it was a very unrealistic death as well. With how well the past witches seemed to be killed this is the least believable death. 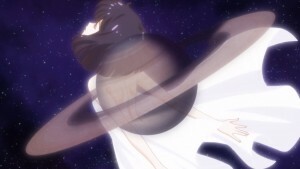 The only good thing about this episode is seeing Saturn and her back story. Although it was confusing in both the manga and crystal. I’m assuming Pluto died during that time and was reborn at the time door. The problem with the manga in general is the fact that Naoko never planned it beyond the first arc which made the other acts much more confusing because she never got to do the story as a whole story. Crystal probably could have had her consult or she could have been more involved to fix her story, but I guess it’s too late for that. Mistress 9’s introduction was the best part of this episode. There were some issues with the whole execution of her scenes in this episode, but overall good job. They elevated the manga scene. In the manga you don’t really know if the hands were some magic summoning but here they made her hair form the hand that rips out Chibimoon’s crystal and soul. I’m glad they showed the soul being given to her, although I wish they showed it better. In the manga it isn’t as clear that Mistress 9 didn’t just take the brooch and it ended up killing Chibimoon. Here they made it clear that her soul was also stolen. The ending battle scene if you can even call it that with Super Sailormoon, Tuxedo Mask and the Outers hiding in the tree was terrible. 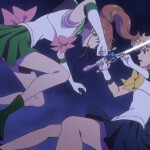 Super Sailormoon did what she did in the Pluto episode when Tellu tries to kill Chibi Moon. She just stands and screams instead of actively doing anything. At least this episode she got a new attack so she could have used that without the stock footage of course. The Outers are strong but yet all they do is hide in the tree and do nothing. Even Pluto who is Chibi Moon’s friend is too busy having a chat instead of actively doing something. Even the manga made the scene just as lame tried to have it seem like they tried to stop MIstress 9, but got blasted with energy. It’s not made all that clear, but it feels like that is what the author was trying to show even if it looks nothing like that. Here all the soldiers do absolutely nothing. The only person that tries to do something is Tuxedo Mask and as expected it didn’t work out. Either way this episode was better than the last episode but the Rainbow Moon Heart Ache reused stock footage, recycled footage, constant Flashbacks of Saturn as if we haven’t seen the scene twice before, Lackluster battle, and ending scene made this episode only slightly better than the previous episode. I’ve noticed they start talking while the commercial break eyecatch/episode title is on screen. I wish they would not do that. I hope they stop with the extended recap footage too. let me just say, i love that you type “sailormoon” as one word, the way naoko intended. youre a true OG sailormoon fan! Hmmm… This is Sailor Moon, not DBZ. But power-ups have always been a big part of Sailor Moon. 5 arcs, a new power-up each season (2 included with Infinity). This is relevant in both series and the manga. Sailor Moon would never be able to defeat her enemies without her upgraded attacks each arc. It is very relevant. I wonder if the “patrons” joke was a 4th wall breaker? Meaning they have sponsers for the manga/anime itself. That or sponsors for the things they do but it wouldn’t make sense why michuru would be mad and sailor moon not understand what she meant by saying that.